Adobe's Flash application may have been acquired when it bought Macromedia, but company names don't matter. What does is that Flash is the common denominator of the interactive web and now the company has unveiled its successor. 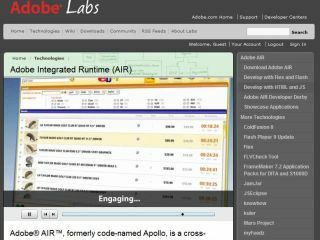 Previously codenamed Apollo, AIR (Adobe Integrated Runtime) is designed to take cross-platform interactivity to the next level. We asked Computer Arts ' News Editor Tom Dennis to lift the lid off the new technology and explain why Adobe thinks it will succeed Flash as one of the cornerstones of the interactive Web.